‘The new owner, Mr Cuthbertson, immediately set about a programme of radical change to both the house and to the gardens. The Ordnance Survey map of 1914 shows something of the changes made – two small buildings have appeared on the east side of the gardens, one within the wooded area, the other on the edge. A formal terrace now crosses the gardens between the house and the lake. A “garden walk” has been added to the east of the garden, on land reclaimed from the Park. 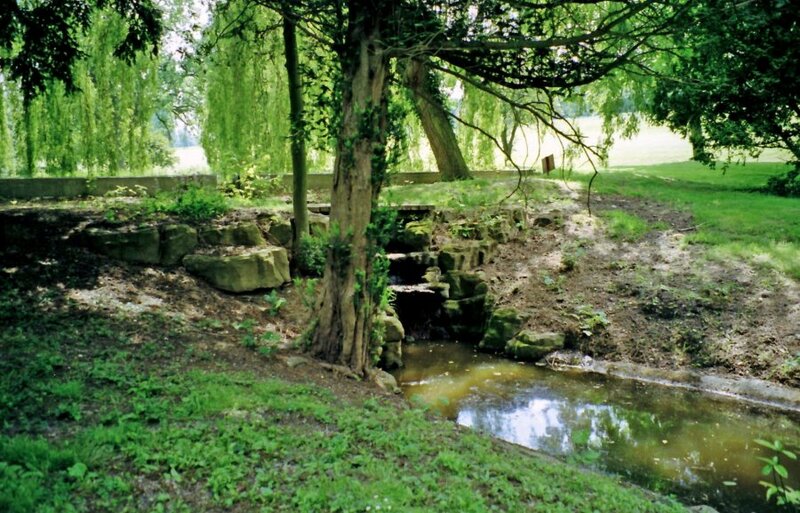 ‘Of particular interest is the stream and rock garden running through the wooded area to the west of the garden which, together with the rockeries edging the north bank of the lake, is built of artificial stone in the style of James Pulham . 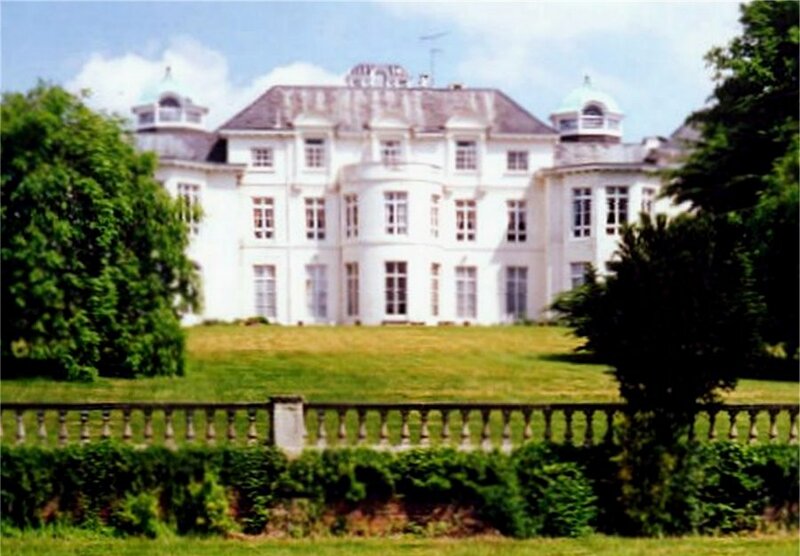 . .
‘Bushey House occupies an elevated position on the main road from London to Bushey, and is the residence of Mr E H Cuthbertson. The mansion, which is built of white stone, is approached by a fine drive. The lawns and gardens have been much enlarged, and made more beautiful since this gentleman has been is residence during the last seven years. The grounds are entered through ornamental iron gates, and nearby are some beds and arches of roses, planted in well-trenched ground that originally formed part of the park. These rose trees are flourishing splendidly, and many of the blooms seen on them at the time of my visit were quite up to the best exhibition standards. They are planted in a group of one colour, and the flowers are used for decoration in the residence. Other large beds in the front of the mansion are planted with roses, which succeed everywhere in Bushey House gardens. ‘Near the house, on a broad terrace, are a number of flower beds, with statues and large vases. The arrangement is after the Italian style , and they appeared very bright with their summer occupants. The conservatory was with groups of decorative plants, including hanging baskets of ferns and suitable plants. The terrace was adorned with two very fine specimens of the pomegranate. From this spot a beautiful view is obtained of the lawns in the foreground and of the distant hills beyond. ‘At the foot of the lower wall of the terrace was growing a collection of half-hardy plants, including Grevillea rosmarifolia, Carpentaria californea, myrtles, camellias, choice varieties of ceanothus, Caesapinia japonica, Buddleia variabilis, Veitchians and many others. These were in a good condition of growth, and made a pleasing covering for the wall. Around a stretch of ornamental water at the bottom of the lawn, near the terrace, were some fine specimens of Acer Negunda variagata; the pond itself was planted with choice varieties of water lilies. Rambling roses and cone-trained specimens of pelagoniums, some 400 plants to a bed, appeared very effective near this water. ‘By the side of a path near this side of the grounds are some cleverly executed miniature rock gardens. Small rustic bridges span other ornamental water hereabouts, and the watersides are planted with choice aquatic and bog-loving plants. At a distance from the water, banks and borders are plantedwith a collection of choice shrubs, both deciduous and evergreen species. I noticed a fine plant of Davidia Involucrata and another of clematis Montana rubens. There were also seen Astilbe Davidii flourishing grandly by the side of the water, Loropetalum chinense,Albelia floribunda, Cyrilla raceniflora, Enkianthus campanulatus, Cytieus Sessiflorus, Olearias in variety, rhododendrons, Cistus ladiniforus, Andromedas in variety, spireas etc. The rockeries contain a choice collection of rock-garden plants, all of which grow freely, oncluding many half-hardy species. ‘In a corner nearby was massed a representative collection of succulent plants, some of which were handsome specimens. In the glasshouse were seen good crops of grapes, peaches, melons and figs, also plants for furnishing the conservatory. One greenhouse was entirely filled with plants of Oalanthe, and another with Codiaeums. A batch of Clerodendron fallax was contained in another house; this plant is much prized at Bushey House for its beautiful flowers. In the kitchen and fruit gardens were noticed many plants of chrysanthemums. The gardens are maintained in a high state of efficiency, reflecting credit on the gardener, Mr C G Blake, and denoting the interest taken in horticulture by Mr and Mrs Cuthbertson. It is interesting to note here that Mr Cook would have had a good knowledge of the Pulhams; work, because their gardens at Leonardslee – discussed and pictured in my very first ‘Site of the Month’ article in June 2011 – was created in 1890, and was one of their most distinguished works. Edward Hedley Cuthbertson had two sons, Edward and Hugh Edward Jnr was born in 1888, and was educated in Malvern College and Clare College, Cambridge. He was a keen sportsman, and played cricket for Cambridge University, and also got a Blue for football. He followed his father into the Stock Exchange in 1911, but enlisted in 1914, and served in France. He was twice invalided out before being sent to Mesopotamia, where he died in hospital in 1917. Hugh, his younger brother, was killed in action in France a year later, and they were both commemorated in the Tower of London display of ceramic poppies in 2014. Needless to say, most of the details described in Mr Cook’s evocative article, have long since gone, but my visit in 2001 revealed that some of their handiwork still remained fairly intact some 100 years later. It was obviously a comparatively small installation by their standards, but still very pleasant. 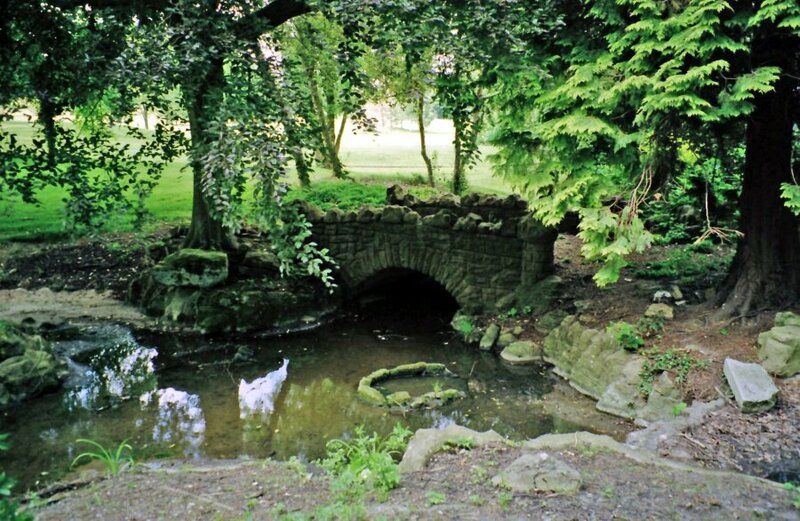 The rock-lined stream still meanders beneath its ‘small rustic bridge bridge, and over a small cascade into the lake. Fig 1 shows the rear of Bushey House from the lawns below, and one can’t help wondering if the Pulhams also provides the balustrading during that time. Fig 2 shows the cascade that was not flowing at the time of my visit, and Fig 3 shows the bridge. Bushey House became the home of the Beaumont Care Home in 1996. Posted on November 1, 2015 June 4, 2016 by Claude HitchingPosted in Sites Month 2Tagged . . James Pulham and Son, Beaumont Care Home, Bushey House - Watford, cascade, Edward Hedley Cuthbertson, George Lake, ornamental lake, rock-lined stream.